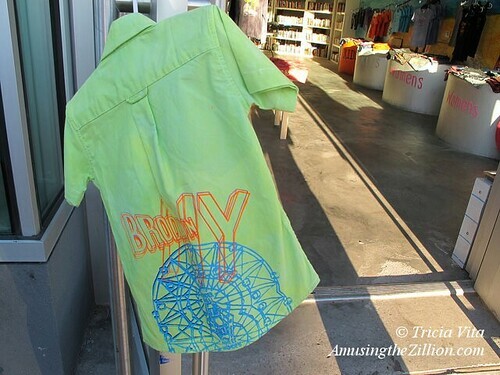 “The French have never left,” says Brooklyn Rock brand manager Seth Braunstein when ATZ asks where the year-round tourists who visit his Coney Island shop are coming from. 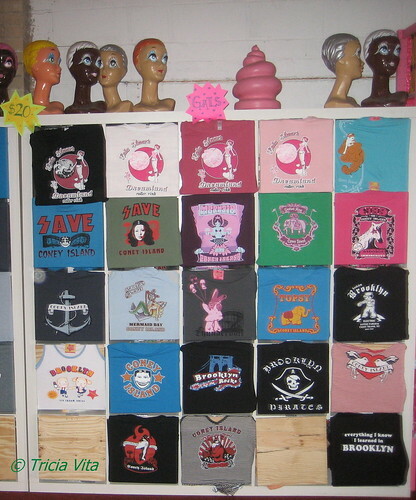 Located across Stillwell Avenue from Nathan’s Famous, which is also open daily regardless of the season or the weather, this one-of-a-kind shop is one of the few places in Coney to buy a souvenir tee in February. 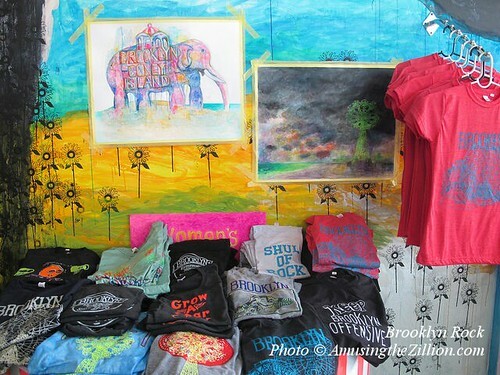 What makes Brooklyn Rock’s tees out of the ordinary, says Braunstein, is that each one of the shirts is hand-dyed in unique colors and hand-printed from hand-drawn designs by artists Chris Smith and Yukiko Wada, the couple who founded the business in 2002. “We start with white American Apparel tees made in the U.S. out of cotton grown in the U.S,” he says. In the afternoon sunlight, the colors are especially vibrant and conjure up summery dreams on a wintry day. 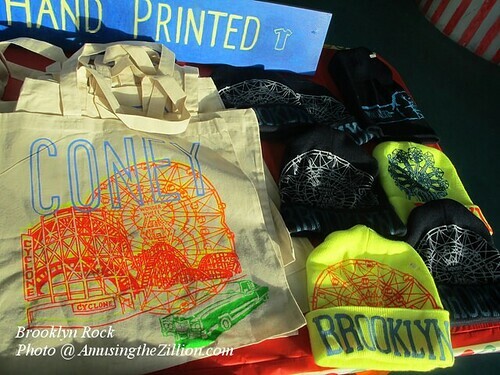 Brooklyn Rock’s tees, hoodies, hats, totes, knapsacks, aprons and other hand-printed items range in price from $15-$60. 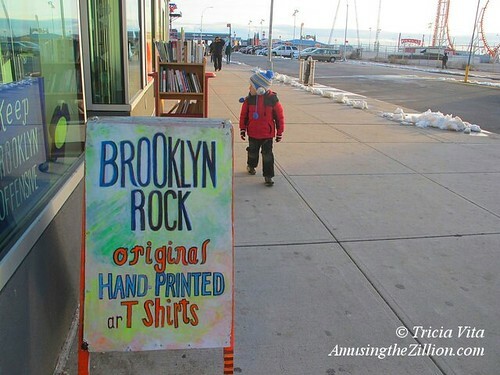 One specialty at Brooklyn Rock that you may not expect to find in Coney Island is their book rack, which is stocked with gently read copies of classics by Ayn Rand to Kurt Vonnegut. The used books come from their friends at Williamsburg’s Book Thug Nation and Bushwick’s Human Relations, whom they’ve known since their days as fellow street vendors. Books are priced at $5 and $8. 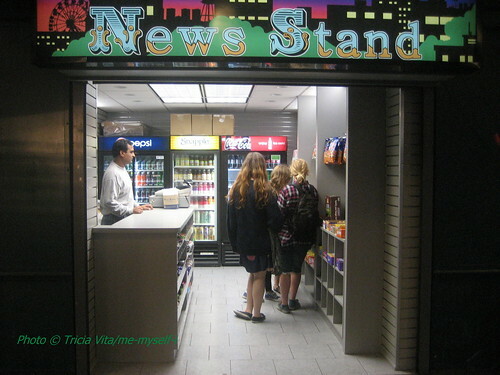 Before opening their Coney Island store in May 2013, the Brooklyn Rock team wholesaled to children’s shops and Coney Island USA’s gift shop. 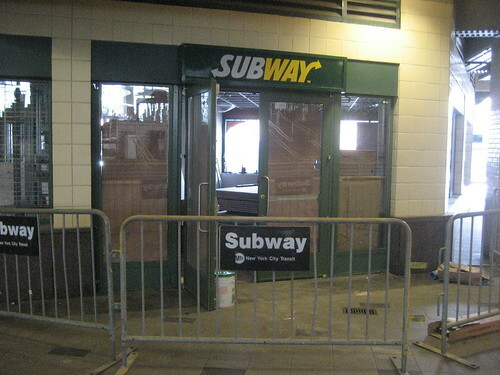 They set up shop in a street kiosk on Bedford Avenue, a shipping container at the now defunct DeKalb Market, and a store across from Barclays Center, where foot traffic turned out to be slow. 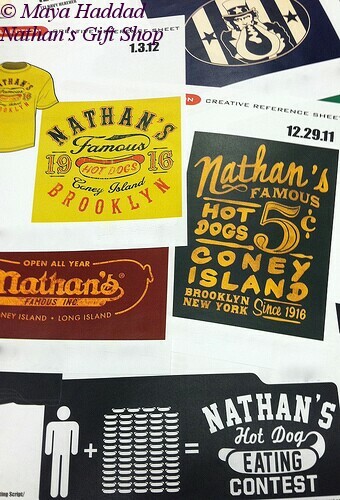 Their Coney Island store is in Thor Equities’ retail building at Surf and Stillwell, where current tenants include It’Sugar, Rainbow Shops, Surf & Stillwell Brooklyn Apparel Co., the Brooklyn Nets Shop, a couple of mini-arcades and the soon-to open Wahlburgers franchise. Only It’Sugar and Brooklyn Rock remain open year round. How did this Bushwick-born Mom and Pop get their foot in the door? Brooklyn Rock, 3015 Stillwell Avenue, between Surf Ave and the Bowery, Coney Island, 11224. Winter hours are 12 noon till 7pm. UPDATE: This store has closed! Read “Thor’s Coney Island: Brooklyn Mom & Pop Out But Not Down” (February 25, 2015) for details. Bump and dance! 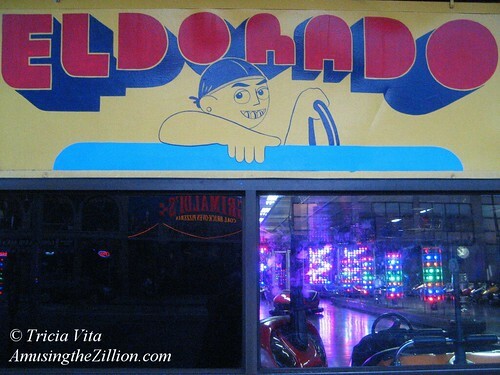 Coney Island’s amusement parks closed for the season at the end of October, but this weekend–November 2nd and 3rd– you can still go for a ride at the Eldorado Bumper Cars, play games in the arcade, bust balloons at the stands on the Bowery, and dance with Miss Coney Island. Gordon Lee, who operates the independently owned disco palace of bumper cars on Surf Avenue, says he will keep it open Saturday and Sunday from 12 noon till whenever–usually 8 or 9pm. On West 12th Street near the Boardwalk, the windows featuring the dancing doll “Miss Coney Island” and the miniature animated rides of “Coney Island Always” will be open from 2pm, along with Skin the Wire, Roll-A-Coaster and other whimsical games. “Don’t Postpone Joy,” says a sign on the door. It’s still costs only 25 cents a dance or to set the mechanical rides awhirl. You can start your Christmas shopping too. The stand next door to Miss Coney Island has been transformed into a gift shop with glass pendants ($5.00 each) and “Limoge inspired” treasure boxes galore ($8.00 each). 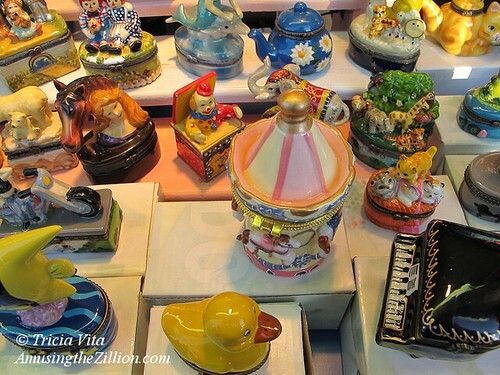 ATZ bought a mermaid-shaped treasure box but there are plenty more. 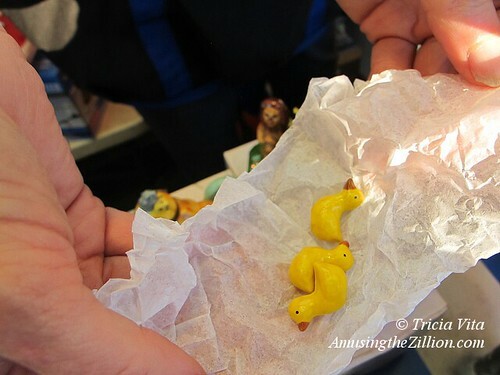 Each box holds tiny secret treasures like the three little ducklings seen below. 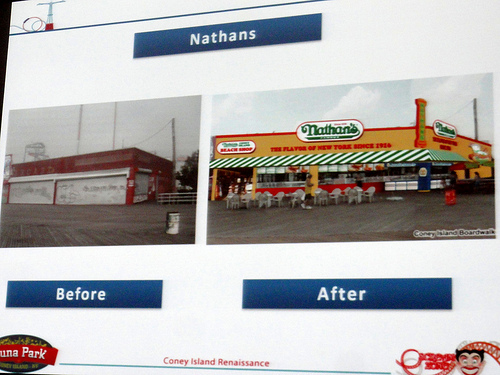 See “Coney Island Always: Visiting the Big CI Year-Round” for info on what’s doing in Coney’s amusement area in November. 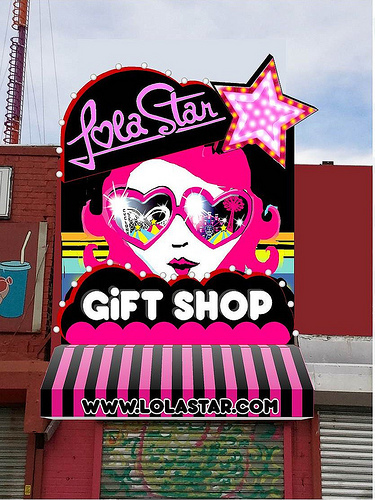 When we stopped by Lola Star’s Boardwalk Gift Shop on Friday, rainbow-colored floor tile was being laid and a humongous “Dollar Sale” was in the works. The fashionably skinny boutique was the only store on the Boardwalk open for business since the others are still being renovated. Happy Birthday Woodrow Wilson and Calvin Coolidge! We’ve been saving this pic of the seldom seen Hall of the Presidents in the Coney Island USA Building for Presidents Day. 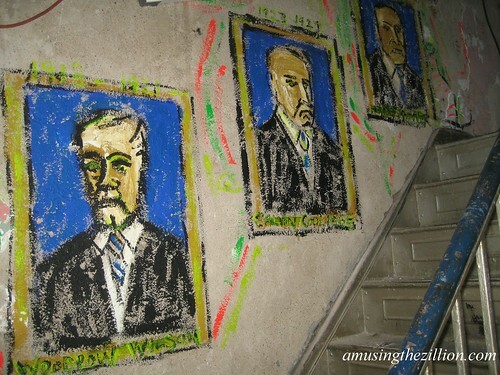 CIUSA artist in residence Marie Roberts painted the murals in a back stairwell for the 2008 Creepshow at the Freakshow . The artwork still exists though it will be painted over next Halloween. The theme was Phantom of the Presidential Wax Museum. The mural is meant to be viewed under black light as seen in this superb photo from jamie nyc’s flickr set of the haunted freak show tour. While the Hall of the Presidents is not in a public area of the building, you can celebrate Presidents Day Weekend in Coney Island by watching the Polar Bear Club Swim on Sunday at 1 pm. Join the Bears for brunch afterward at CIUSA’s Freak Bar. Bagels, cream cheese, coffee, espresso and cappuccino will be available for purchase at Sunday’s Polar Bear Brunch. While America honors Presidents Day with sales galore, Coney Island USA continues its online gift shop sale of Mermaid Parade, Film Festival and Creepshow posters; Funny Face, Madame Twisto and Serpentina T-shirts; and Dreamland Bar & Grill tokens. Winter hours at the Coney Island Museum and Gift Shop are Saturday and Sunday, 12-5 pm. 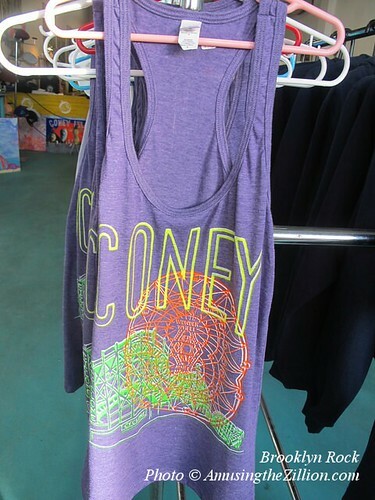 Coney Island USA, 1208 Surf Ave, Coney Island. B,D, F, Q trains to Stillwell Ave.